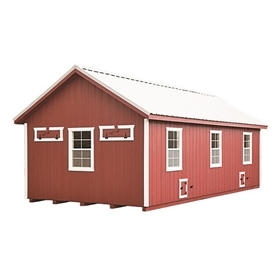 This quality-made coop is made to order by the Amish in Pennsylvania, USA. It is quite spacious and will house up to one hundred chickens and store all of your feed and chicken coop items! This coop includes many features that would be upcharged “extras” on other coops, however, there are an abundance of options to choose from for those who want to customize their coop. When you enter this ginormous chicken coop, you step into the Feed Room first, situated between the two Chicken Areas. The Feed Room has two interior wire doors to access each of the adjacent Chicken Areas. The Feed Room has one window to let natural light in and each Chicken Area has three windows and two ventilation slots to provide excellent light and ventilation. From the Feed Room you can collect your eggs by lowering the hinged panels on the walls of the Feed Room. There is also plenty of room to store your feed and coop supplies in this area. See below for more details! This coop is made to order, so please allow up to two months for delivery. Seven double-hung, slide-up windows provide excellent ventilation and plenty of natural light. Each window has a standard screen that is covered with heavy-duty, 14 gauge, half-inch, vinyl-coated wire to keep out predators. The window is 18” wide and 23” high. Two gable vents (not shown) come standard with your purchase. The ventilation slots are covered on the inside with sturdy half-inch vinyl coated black hardware cloth wire, to keep out wildlife. These provide plenty of ventilation, which is essential to avian health. 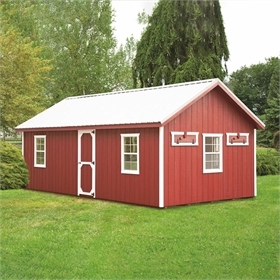 Your chicken coop comes standard with two small, 9-¼” wide x 12” high, latched wooden doors for you to open and close to let your chickens in and out of their coop. If you prefer, you can upgrade to automatic doors. (We feel it’s one of the best investments you can make!) Learn about the various automatic door choices, here. 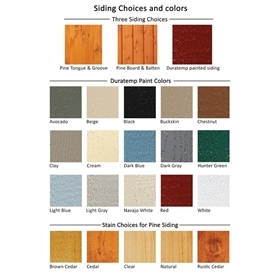 Five-eighths inch, ACQ pressure treated plywood flooring comes standard with your purchase, or you can upgrade to an epoxy floor for ease of cleaning. It is durable, easy to clean and 100% moisture resistant. The epoxy flooring has a smooth brown finish. All hinges and locks are zinc plated and painted black. The entry door has a keyed lock handle. The chicken doors have latches that can be latched in the open or closed position. These chicken doors can be locked in place with a Master Lock or a Clip (not included). If your coop will be placed in an area of your yard where there’s electricity nearby, consider the electrical package! You can purchase either the electrical package alone, or the electrical package with heated roosts. The electrical package includes three interior light fixtures, one light switch or timer, three outlets with two receptacles, and an extension cord hookup to attach to your primary electricity source. If you select heated roosts, each heated roost will need a receptacle but that will leave one receptacle free to plug in a heated waterer (not included) or one of our safe heaters (not included). This electrical package also includes a separate and dedicated outlet for each of the chicken doors if you decide to order the basic or advanced chicken doors with your coop. You can also select an Electrical Package with Heated Roosts. Talk about luxury! One wooden roosting bar in each of chicken areas will come equipped to be heated. The heated roosts will be plugged into the receptacles provided by the electrical package, and it’s heated from within by a heated rope, which is completely sealed for safety. Heated Roosts are not an option with the Solar Package. No electricity? No problem. You can order our Complete Solar Package which will include two solar kits for two auto chicken doors (sold separately), three solar powered lights and one light switch or light timer. If you decide to go with this package, select either the Basic Chicken Doors or the Advanced Chicken Doors from the drop-down menu above. If you just want solar powered auto chicken doors and not the rest of this package, you can select the auto chicken doors with solar power from the same drop-down menu. We always recommend runs be purchased with coops--unless your coop is going to be placed inside a larger, predator proof chicken yard already! You can either build your own run, or add one of our fully enclosed runs to your order. Our runs have half-inch vinyl coated black hardware cloth wire. If you want a roof on your run (a great idea, to allow your chickens to be outdoors in "fowl" weather! ), we’ve got that, too. Order the epoxy flooring and use the large access door to rake or sweep the waste out of the coop. 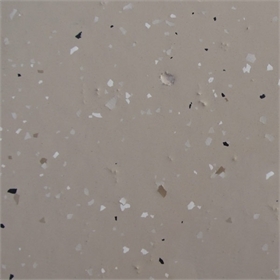 The epoxy floor will allow you to remove the waste and clean the floor more easily. It is durable, easy to clean and 100% moisture resistant. The epoxy flooring has a smooth brown finish. Each coop is made to order. Please allow up to 2 months for delivery.